If you want to capture your travel adventures this summer and need to travel light, make your smartphone your camera of choice. For tips on how to capture your travel adventures in the best light, olloclip and Art of Visuals present an #ollotrip to the Pacific Northwest to visually inspire you. "The Pacific Northwest is undeniably one of the most beautiful parts of the country. We wanted to provide the story of adventure and travel through mobile photography–and provide the opportunity to experience it through the eye of an olloclip lens with photos taken by one of the world's fastest growing photographic communities, Art of Visuals (AOV)," said Patrick O'Neill, founder of olloclip. "AOV is the globally recognized media company behind the largest photography community on social media. More than one million people in 120 countries turn to them on Instagram and Facebook for visual inspiration." A phone can be tricky to hold, which can lead to shaky video. Video grips allow for greater camera control to capture more stabilized and smooth content. There are a few very nice options ranging in price from $50 for the olloclip Pivot to $300 for the DJI Osmo Mobile. Bring a friend. Shooting a human subject in your landscape photography is ideal for showing perspective of the surrounding scenery. Try adding a brightly colored jacket for a nice contrast against the natural background. Avoid harsh light or shadows at all times. When shooting outdoors, look for nice well balanced soft light, preferably in the morning or evening. Having the sun at your back will light your subjects. Conversely, if shooting into the sun, you'll be able to capture nice silhouetted photography. Most great photographers edit their own photos. Mobile apps like Lightroom, Snapseed or Afterlight are ideal for fine tuning favorite shots. If editing on a computer, take it a step further with Lightroom presets from Art of Visuals. Experiment with different mobile lens add-ons to get more landscape into the camera's frame with a wide-angle lens or use a telephoto lens to add a beautiful shallow field of view for portrait shots. olloclip lenses are perfect for live broadcasting or Instagram Stories because of their ability to put a wide-angle lens on the front camera—opening the picture to show more of what's happening around you. Then, check out these video journals for inspiration on how to create an adventure worth sharing and how AOV tested the limits of the iPhone, olloclip lenses and olloclip's new Pivot video grip through the rain and sunshine to capture the rawness and beauty of the Pacific Northwest. Join AOV's photo editing contest by showing your editing skills with unedited photos from the trip. Five winners chosen by the AOV staff will each win an olloclip Core Lens Set. The contest begins on May 17, 2017. Sign up at http://www.artofvisuals.com/olloclip-contest/. In 2015, Art of Visuals was founded with a voice that continues to resonate with content creators around the globe. AOV is cultivating this evolving world of content creation through powerful imagery and video, inspiring millions to create something meaningful. 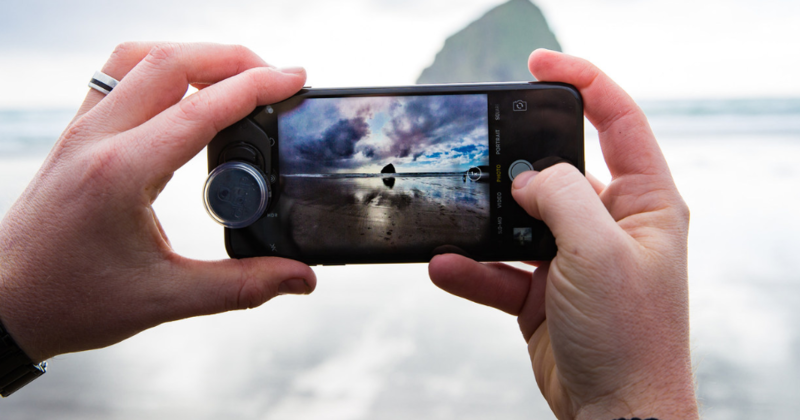 olloclip includes a growing line of ground-breaking lenses and accessories for the mobile photographer. The company continues to innovate with new products like the Active Lens featuring Ultra-Wide lens & Telephoto lenses, Macro Pro Lens and Studio—an integrated mobile photography solution. The company remains committed to finding new and exciting ways to enhance the mobile photography category—and making inspiring photos and video fun and easy to capture on your mobile device. olloclip.com.